WebhostingHub offers reliable, affordable web hosting geared toward customers looking to host their personal or small business website. Included with all plans is a 90 day money back guarantee which allows customers more than ample time to be sure the service is right for their needs. Their packages and pricing makes them a top contender in the industry. WebHostingHub offers one shared hosting solution that includes everything needed to run a successful personal or business website. With a host of unlimited features as well as e-commerce tools and partnerships with top marketing companies should you need to get the word out about your online business. As expected from a top hosting company, WebhostingHub offers 24/7 U.S. based support by way of toll free phone, live chat, and e-mail ticket system. Also included is an online knowledgebase with a wide variety of articles including tutorials on popular scripts like WordPress and Joomla. WebhostingHub provides ample support to it’s clients so they can get the most out of their package. One thing that sets WebhostingHub apart from the competition is their valuable partnerships with several marketing and service companies to further improve the hosting they offer. Perfect for businesses, these partnerships are an asset to not only grow your client base and recognition, but also to keep your data safe and secure. 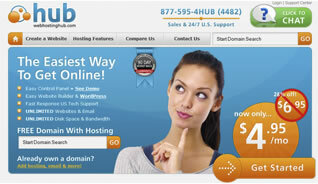 WebhostingHub offers the industry leading cPanel control panel. With it’s snappy response and library of features it is by far and away the best control panel on the market today. No other hosting control panel can match what cPanel has to offer in the way of ease of use or responsiveness.